For the past few months, I’ve been living and posting from the west coast, as has become our routine during the winter months. Regular readers have likely noticed that new posts show up around 9am/10am ET instead of 6am/7am ET. This will be the last post from the west coast this winter as we are returning home to NYC this afternoon. I am not entirely sure how I’m going to get a blog post in tomorrow morning as we arrive late and I’ve got an early breakfast, but I always seem to find a way. It certainly will have to be posted by 7:30am ET before I start my day. Maybe I will write it on the plane home this evening. The winter out west routine works really well for me. It gets me away from the hustle and bustle of NYC and in a bit more reflective and relaxed mood. It’s not a vacation. I work ten hour days, but I start them at 5am and end them mid/late afternoon, in time for a bike ride or a late afternoon yoga class. I am going to miss all of our friends and family in LA and the incredible weather, vegetation, sights, and smells. 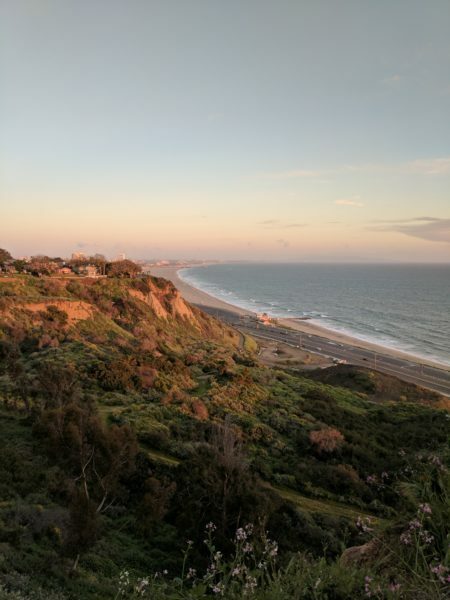 Here’s a photo I took from a sunset walk on the bluff with my friend Mark last week. I will miss this place, but I’m also eager to get back to the big apple.